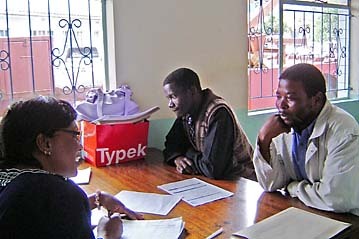 Caritas Swaziland open the Refugee Section in 1989. In close collaboration with the Ministry of Home Affairs (Refugee Department) and UNHCR (United Nations High Commissioner for Refugee) provide to deliver day to day humanitarian assistance in the areas of State protection, legal documentation, income-generation, domestic support, health and education. The Kingdom of Swaziland ratified the OAU Convention Governing the Specific Aspect of Refugee Problems in Africa in 1989 and the 1959 Convention relating to the Status of Refugees and its 1967 Protocol in 1995. Further, Swaziland ratified the Kampala Convention, in 2012. Caritas Swaziland assists refugees and asylum seekers, who reside in the Malindza Refugee Reception Centre (Lubombo Region), and the major sites like Mbabane, Manzini and other towns all over the Country. Generally they escape from their Country of origin because of wars, persecutions, hunger, violation of human rights and a well-founded fear of being persecuted for reasons of race, religion or nationality, looking for freedom, safety and protection. They come predominantly from the Great Lakes Region, like Burundi, Somalia, Rwanda and Democratic Republic of Congo (DRC). Once they arrive in Swaziland they are legally received without any documentation, accommodated at the Malindza Refugee Reception Centre and provided with the basic needs through the Tripartite who is composed by Caritas Swaziland, UNHCR and Ministry of Home Affairs. We also work closely with other international and national stakeholder to assure the respect of human rights, in order to offer protection. We focus our intervene to assist all of them completely for education and medical assistance, psycho-social support, food, self-reliance project.